Xu Lizhi was twenty-four when, in 2014, he threw himself from his dormitory window. He worked at the nearby Foxconn factory, where he spent long days silently assembling electronics he would never be able to afford. His is not an unfamiliar story: eighteen Foxconn workers attempted suicide in 2010, leading to fourteen deaths. Tian Yu also worked at Foxconn. Originally from a small village in Hubei province, Tian – like Xu – moved to Shenzhen, a mainland city just north of Hong Kong, because of the potential to earn a higher salary. In 2010, she threw herself from the fourth floor of her factory dormitory. Tian survived, but was left paralysed from the waist down. She was seven­teen at the time. The Western press seized on the story, dubbing Foxconn the ‘suicide express’; tributes were written to those who had died so we could have the latest smartphone. It was a narrative that fit neatly with our image of China as the ‘sweatshop of the world’, a country where much of our disposable lifestyle – goods, technology, oddments – is made possible because of exploitive labour practices. The truth is more complicated. China has one of the highest suicide rates in the world: according to statistics from 2007, more than 287,000 people kill themselves in mainland China each year. The rate has fallen since the country embarked on a process of urbanisation, but the number is still far higher, proportionally, than the rate of suicides at Foxconn in 2010. This is not to suggest that the conditions at Foxconn are in any way acceptable, or that the suicides were not a direct consequence of those conditions, but rather to point out that there is a serious problem with Chinese society more broadly. 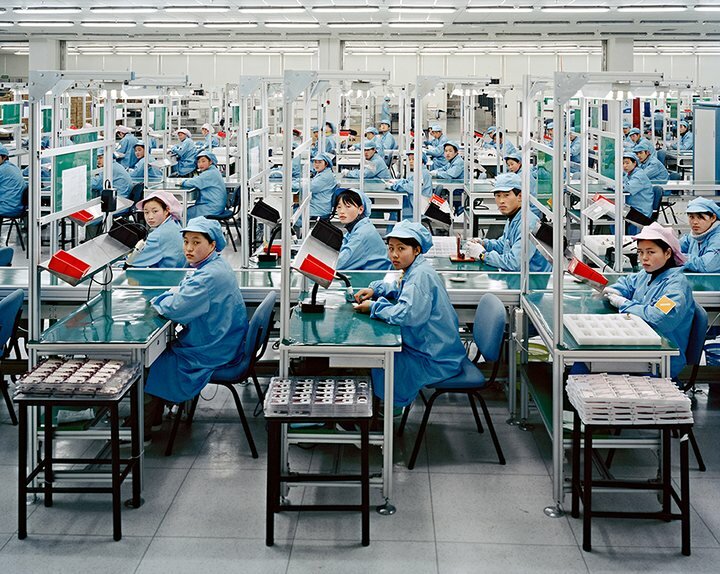 To see this as the failing of one company is to miss the reality of Chinese labour today. China is the world’s most populous nation, with 1.35 billion people spread across twenty-three provinces. The People’s Republic of China (PRC) was founded in 1949 after Mao Zedong’s Communist Party defeated the nationalist Kuomintang. It’s currently the world’s second largest economy, and is expected to surpass the United States in terms of nominal GDP by 2026. The rate of change in China is staggering by anyone’s measure. From the mid nineteenth century to the first two decades of the twentieth century, Shanghai’s trade and commerce was dominated by European merchants. Architectural remnants of this influence remain: the Bund, a waterfront area on the western bank of the Huangpu River, is dominated by buildings that would fit more comfortably within the surrounds of European capitals. On the river’s east bank is the Pudong district, a ‘special economic zone’ since 1993. Before then, Pudong was a poor, largely undeveloped neighbourhood populated by internal migrants who had come to Shanghai for work. Today, Pudong is home to the Lujiazui Finance and Trade Zone, the financial hub of mainland China. It boasts a skyline of neon-lit skyscrapers – home to the world’s largest multinationals – as well as luxury apartment complexes and a futuristic TV tower. There is, perhaps, no better image of China’s boom. In less than thirty years, China went from Mao declaring that the ‘socialist system will eventually replace the capitalist system’ to Deng Xiaoping, former paramount leader, reassuring the country that the ‘basic contradiction between socialism and the market economy doesn’t exist’. In between, China went through the Great Famine, which killed an estimated forty-five million people, and the Cultural Revolution, which tore a not-yet-recovered society apart. China’s transition from socialism to market liberalisation – usually referred to as state or authoritarian capitalism in the West and as ‘socialism with Chinese characteristics’ in China – has radically changed the way all levels of society interact with the state. Many in the West scoff at talk of socialism with Chinese characteristics, pointing out that the technocrats who run the country are, perhaps, today’s most successful capitalists. But it’s wrong to think of this as a purely economic principle. Its roots lie in Mao’s adaptation of Marxism-Leninism: China was, at the time, an agrarian society and Mao believed it would be the peasantry – not the working class – who would lead his revolution. The same rhetoric is employed today, despite the fact that the country is on a very different path. This may seem anachronistic, but it’s ideologically important: the Communist Party’s legitimacy is derived from its positioning of itself as the rightful custodian of Mao’s revolution. The Communist Party rules not only with the full force of the state, but also with the consent of the majority. There is, of course, no alternative party, but that does not fully explain the situation. Martin Jacques has argued convincingly that the Communist Party enjoys far greater popular legitimacy than any Western government because it’s seen as the guardian of the Chinese ‘civilisation state’. Internally, China is regarded as more than a nation state – it’s a cultural entity with a unique identity. While partly modern, this identity is constructed primarily around China’s position as one of the world’s ancient civilisations. The Communist Party is not the monolith many in the West think of it as. It has two distinct factions: the ‘populist coalition’, made up of cadres from less-privileged families who made their careers in the poorer inland provinces, and the ‘elitist coalition’, made up of ‘princelings’ (those from families of veteran revolutionaries or high-ranking officials) in the wealthy coastal provinces. These two factions represent distinct socioeconomic and geographical constituencies: the populist coalition is, generally speaking, more concerned with vulnerable social groups like farmers, migrant workers and the urban poor, whereas the elitist coalition tends to be the voice of China’s entrepreneurs. Current President Xi Jinping heads the elitist coalition. Since coming to power in 2012, Xi has moved away from collective approach of former leaders, increasingly concentrating power in his own hands. Many commentators have been quick to dub his leadership style ‘Maoist’, even though the Communist Party is a very different entity today. As China’s economy grew – regularly at over 10 per cent per annum – the living standards of the working class generally improved. It ushered in a time of unprecedented stability: life remained tough, but the country’s direction was no longer subject to Mao’s whims – five-year plans, collectivisation and purges were abandoned in lieu of economic growth and development. Growing resistance – albeit still small – to the state’s authoritarianism, censorship and official corruption accompanied this rise in living standards. The 1989 Tiananmen Square massacre, which saw demonstrating students murdered by the People’s Liberation Army, is the best known and most violent of these incidents. Even today, the Communist Party tries to erase the event from its national history: each 4 June sees an increased security presence at the square, a tightening of social media monitoring and the detention of activists and dissidents. The response to the student demonstrations was a pivotal moment. Claims the Communist Party still embodied its original revolutionary principles, even after gunning down its own citizens, spoke to the ideological incoherence within the party. It had used state violence to stamp out a popular revolutionary movement in order to ensure its project for economic growth remained on course. Some of the student protestors at Tiananmen Square carried Mao’s portrait. The symbolism was clear: they – not the technocratic cadres – were the rightful heirs of Mao’s revolution. So far as urban workers are concerned … they are losing the social benefits of communism and getting little in return, beyond ‘market discipline,’ linkage of wages to profits – a contract system hailing back to feudal times. This is the defining feature of contemporary China: market liberalisation has allowed the nation’s wealth to skyrocket, but at the same time has brought about some of the world’s worst income inequality. The richest 1 per cent own a third of the nation’s wealth. In 2014, China’s Gini coefficient, a widely used measure for inequality, was 0.469 (the World Bank considers a coefficient above 0.40 to represent severe income inequality). Beijing’s determined focus on economic growth has meant that basic services – such as adequate housing, healthcare, education and welfare – lag a long way behind. It’s estimated, for example, that about 80 per cent of medical and healthcare services are concentrated in the cities, which means that timely medical care isn’t available to the more than 100 million people living in rural areas. Similarly, students in rural areas are severely disadvantaged: only 10 per cent of students admitted to Tsinghua University, one of the country’s most prestigious tertiary institutions, are from rural origins, despite the fact that they make up around 44 per cent of the total population. These systemic inequalities have been melded into an authoritarian state: there is no separation of powers, citizens are denied fundamental freedoms and censorship is practised on a scale never before seen. The justification for all this is growth and development. As one might expect, a system that has entrenched such disparity between rich and poor has had a profound effect on shaping the Chinese working class. It’s not unusual for migrant labourers, such as those at Foxconn factories, to work north of eighty hours a week, typically for very low wages and in appalling conditions. They are often exposed to serious workplace hazards, treated poorly by management and fired – with no recourse to compensation – if product demand slows. One might assume, then, that the conditions are ripe for industrial action. In many ways they are – but there are also some significant cultural barriers that stymie labour activism. In the weeks following the spate of suicides at Foxconn, Guardian correspondent Jonathan Watts went to the factory and spoke with some of the workers. He reported that while few took any pleasure from their work, many also complained about the lack of overtime available (compared to other Foxconn factories). This not uncommon attitude has a lot to do with the unique demographics of China’s working class. The majority of low-paying, unskilled jobs in China are filled by migrant labourers who travel to cities in the hope of earning more money. It’s this cheap labour that has driven China’s economic growth. Today, there are an estimated 277 million internal migrant workers in China – in other words, more than one third of the entire working population. We were not close. Random dormitory reassignments break up friendships, increasing our isolation. Although eight girls were housed in the same room, we were strangers to each other. Some of us had just moved in as others moved out. None of the roommates was from Hubei. Leslie T Chang’s book Factory Girls: Voices from the Heart of Modern China chronicles the myriad challenges faced by migrant workers. Usually in their late teens or early twenties, often living away from home for the first time, these women have to learn how to negotiate workplace relationships, make new friends, go on dates, budget and save, all while dealing with aching loneliness. There is also often strong pressure from home to send back more money to the family. All of this is aside from the actual physical work. One of the great challenges for those trying to organise a labour movement is that these migrant workers don’t think of themselves as part of the ‘working class’. Rather, they see themselves as worker-peasants (mingong). Work is a means to an end: earn, save, return home and raise a family. Rates of turnover are high, and the temporality of the relationship between employer and mingong – in concert with many workers’ goal of earning as much money in as short a period of time as possible – undermines efforts to organise any sort of collective resistance. Structural obstacles, such as the household registration system (hukou), further complicate the situation. Hukou determines where a person is allowed to live and work; it acts as a de facto caste system by entrenching inequality between rural and urban residents. In practice, it means that migrant labourers are working illegally. This translates into limited rights in the city of employment – mingong have no access to welfare services or subsidised healthcare, they can’t purchase property and they are unable to send their children to state schools. Migrant labourers are forced to live a precarious, often transient, existence, moving regularly between their hometown and the city they work in. During the Great Famine, having a rural or urban hukou often meant the difference between life and death. Today, it remains a key component in the Communist Party’s journey to economic superpowerhood. Because the rate of growth in China has been so quick – driven by low-cost exports and leveraged debt to pay for large-scale construction and infrastructure projects – the state hasn’t been able to grow social services at the same rate. So, while Beijing needs the migrant workers supplying cheap labour in the cities, it can’t afford to provide them with the most basic services. The widely unpopular hukou system is now being relaxed in some parts of the country, not because of people’s anger or frustration, but as part of the Communist Party’s stated objective of transitioning from a manufacturing to a consumer economy. China’s three-plus decades of enormous annual growth have left it with some serious – perhaps irreparable – problems: extreme inequality, a seemingly endless list of potential environmental disasters, exorbitant house prices (particularly in the major cities), over-investment and, most notably, under-consumption. In order to successfully manage this transition to a consumer economy, the Communist Party has announced its intention to relocate 100 million people from the countryside to cities by 2020. This mass urbanisation will mean that 60 per cent of the country’s population will reside in cities. The expectation is that these people will consume more, thus continuing to drive economic growth (albeit at a slower rate). This enormous project will have far-reaching and as yet unknown consequences for the working class; its success or failure will depend largely on how the working class responds. On the one hand, the new economy could lead to better regulation, improved conditions, higher salaries and an end to exploitative workplaces. These workers are, after all, the people (read: consumers) Beijing is relying on. But such a vision seems overly optimistic. The reality is that, as growth slows, the manufacturing sector will be the hardest hit. Factories will close, people will lose their jobs and, with little education and few skills, they will have limited prospects. It’s difficult to see how Beijing will be able to create sufficient employment for these people. All of this is taking place against the backdrop of an increasingly restless and less complicit working class, the likes of which China has never before seen. Eli Friedman, author of Insurgency Trap: Labor Politics in Postsocialist China, has written that ‘China is undeniably the epicenter of global labor unrest.’ While there are no reliable official statistics, the China Labour Bulletin, a Hong Kong-based NGO that defends workers’ rights in mainland China, recorded 2,774 strikes and protests in 2015, up from 1,379 the previous year. This is likely just a fraction of the total number, as most go unreported. These strikes usually last less than a day, and worker demands are generally moderate – a small increase in wages, for example, or the payment of late or withheld wages. They are usually organised autonomously, often without the approval of the only legal trade union, the All-China Federation of Trade Unions (ACFTU), which functions as an extension of the Communist Party. With 134 million members, the ACFTU is the largest trade union in the world. Founded in 1925, it’s gone through a number of significant changes. In 1927, Chiang Kai-shek’s Nationalist regime dissolved the ACFTU and executed thousands of unionists and Communist Party members. It was re-established under Mao in 1949, only to be dissolved again in 1966, in the wake of the Cultural Revolution. It re-formed again in 1978, two years after the death of Mao. Today, the ACFTU faces the dilemma of whether to support striking workers or mediate between parties when labour conflicts arise. Recent years have seen large segments of China’s working class become politicised. Many were emboldened by the 2010 Honda strike, an unusual labour protest in that it was highly organised and prolonged. On 17 May, around 1900 workers walked off the job. They were demanding a pay rise – most earned no more than ¥1500 ($310 AUD) a month – and an end to forced unpaid overtime. The strike led to the suspension of operations at all four of Honda’s production bases, costing the company an estimated ¥3 billion ($614,400,220). The strikers returned to work in early June after Honda agreed to increase their monthly salary to ¥1910 ($394.50) – an outcome widely celebrated as a victory for the workers. The Communist Party’s official response was uncharacteristically tempered: then premier Wen Jiabao even spoke publicly about the need for better working conditions. Privately, the leadership was terrified the unrest would spread and undermine foreign investment. According to the Guardian, the governor of Guangdong was called to brief the politburo, and local journalists were instructed to play down the strikes in their reports. This newfound militant spirit quickly spread, despite the best efforts of the state. In mid June, workers at the Guangdong Toyota factory also walked off the job over wage concerns. Since then, labour disputes have been taking place all over China, and with increasing regularity. A nervousness seems to pervade the official response to this growing unrest; the collapse of the Soviet Union still looms large in the minds of Chinese officials, and there is a concern that small-scale incidents such as these could grow into something that can’t be contained. To date, government officials have managed these disputes carefully: picketing workers have, on occasion, been beaten, but Beijing generally prefers to break strikes by appeasing worker demands. But this tactic may be changing. Since coming to power, President Xi has led a broader crackdown on dissidents within civil society: journalists, human rights lawyers, activists and academics have all experienced increased repression. On 3 December 2015, over twenty labour activists in Guangzhou and Foshan were taken into custody, with four arrested on various charges, including ‘disturbing social order’. The recent wave of arrests, along with the increased pressure on the civil society more generally, would seem to suggest that the Communist Party wants to send a message to workers: the kind of low-level unrest that has been permitted for the past decade won’t be tolerated any longer. Since Deng’s reforms, a kind of unofficial pact has existed between China’s citizens and the Communist Party: continue to grow the economy and improve our standard of living and we will continue to allow you to rule. It’s too early to say whether this pact is being tested, but it’s certainly being questioned in a way it hasn’t been before. In the early days of reform, China’s working class was happy with incremental improvements in living standards. Now it’s clear that the elite has benefitted from China’s rise exponentially more than – and often at the expense of – those below them. The poorest 25 per cent of households own just 1 per cent of the nation’s total wealth. Yet, it’s the working class that has shouldered an unequal share of the consequences of this growth: they were the ones killed in the 2015 Tianjin explosion, they were the ones who died when poorly constructed buildings collapsed during the 2008 Sichuan earthquake, they are the ones who can’t buy air purifiers to get some respite from the polluted cities and they are the ones who die young because they can’t afford access to adequate healthcare. These are the consequences of a policy that has, since 1978, privileged economic growth above all else. That violence is inherent in authoritarian regimes hardly needs explanation, but there is also an inherent violence in the kind of exploitation on which capitalism is built. The Communist Party has proven uniquely adept at bringing these twin forces to bear on the Chinese people. When Foxconn’s management realised they had a problem with workers committing suicide, they responded not by easing the oppressive conditions, but by installing large ‘suicide prevention’ nets on buildings. Perhaps it’s these nets – erected not to save lives but to avoid a scandal that could jeopardise productivity – rather than Shanghai’s skyline that is the defining image of China today.